The range and quantity of legislation affecting the voluntary sector makes it difficult to keep up to date with the obligations placed on voluntary organisations. Whether taking on staff, leasing premises, tendering for service contracts, taking out insurance, operating as a charity or changing the organisation's legal structure, staff and committee members need to understand the law. First published in the mid 1980s and now in its eighth edition, this bestselling guide has been completely revised to cover all recent relevant legislation. This includes changes in charity and company law, environmental assessment, risk assessment, licensing, contracts and grant funding agreements, in addition to key changes in employment legislation. As well as explaining the law, the publication provides best practice on: health and safety, equal opportunities and diversity, data protection, confidentiality and email and internet use. It also has a revised section on the 'green office' that details how voluntary organisations can engage with others in combating climate change, reducing energy consumption and managing procurement. 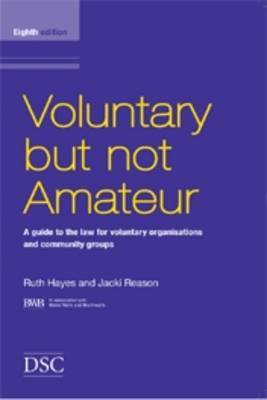 Voluntary but not Amateur is an accessible and indispensable guide for anyone involved in voluntary organisations who wants to understand how the law affects their organisation.